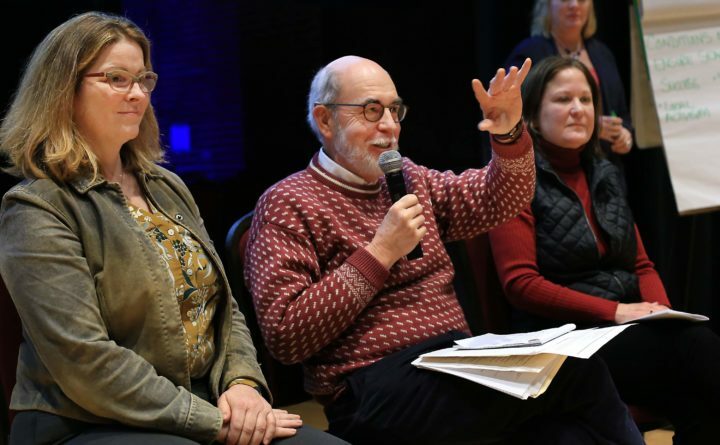 New Hampshire state Sen. David Watters, D-Dover, speaks during a panel discussion after a screening of the environmental film "High Tide in Dorchester" Saturday at the Seacoast Environmental Film Festival in Kittery. Joining him on the panel are, left, Wendi Goldsmith of the Center for Urban Watershed Resilience and Julie LaBranche of the Rockingham, New Hampshire, Planning Commission. KITTERY, Maine — Hundreds of people braved the cold to attend the second annual Seacoast Environmental Film Festival on Saturday. Held at the Kittery Community Center’s Star Theatre, five films were shown, each with a different theme on the state of the environment and on ways people can help on issues relevant to clean water, ocean plastics, sea level rising, food waste and climate change. Each film, presented by local nonprofits, was followed by a panel discussion featuring experts in the topic of the film. Ken Fellows, a board member for the Kittery Land Trust, said the goal of the film festival is to raise public awareness of all aspects of environmental concern. The event was moderated by Melissa Paly, Conservation Law Foundation’s Waterkeeper of Great Bay. She introduced the films and the panel members for each discussion. “Five Seasons,” a documentary about Piet Oudolf, one of the world’s most celebrated garden designers of transformative landscapes like the Highline in New York City. The film revealed the aesthetic and philosophy of a designer who pushes people to rethink the notion of beauty and life through plants. It was sponsored by Timberland, and co-presented with Bedrock Gardens, York Land Trust and the Piscataqua Garden Club. “High Tide in Dorchester” featured coastal communities in the Chesapeake grappling with sea level rise and the challenges of planning, adaptation and retreat from the edges of a rising tide. The film was sponsored by Autoworks, and co-presented with the League of Conservation Voters and NH Coastal Adaptation Workgroup. The message was that entire communities and ecosystems are being swallowed by rising tides, and the message to seacoast area residents was that it is happening here, too, and if steps are not taken to address it, the same thing will eventually happen here. A panel discussion with Julie LaBranche of the Rockingham Planning Commission, Wendy Goldsmith of Urban Watershed Resilience and New Hampshire state Sen. David Watters of Dover localized the global threat and offered some actions that residents can get involved with. Watters said when he first started raising the issues in the legislature, people called it a “fantasy not worthy of debate.” He said they are listening now. LaBranche said inland communities are beginning to see the effects of rising oceans and to realize they need to take hard looks at their infrastuctures. She said regional planning commissions are now including sea level rise into their planning documents. “Albatross” sponsored by Revision Energy, featured artist Chris Jordan’s eight-year odyssey in the Midway Islands in the Pacific Ocean to show how our lives intersect with the natural world. The film was presented by Blue Ocean Society, Seacoast Science Center, Shoals Marine Lab and Sustainable Seacoast. “The Devil We know,” co-sponsored by Conservation Law Foundation and Testing for Pease followed citizens in West Virginia as they take on a big corporation that dumped toxic PFAS chemicals into the local drinking water supply. “Wasted” is a documentary produced by celebrity chef Anthony Bourdain, who circled the globe to show that 1.3 billion tons of food are thrown out each year, and show the people working to prevent the waste. Major sponsors of SEFF are Eldredge Lumber and the Rosamond Thaxter Foundation, as well as Altus Engineering, ARQ Architects, JNL, Inc. and Faith Harrington and Peter Lamb through the Maine Community Foundation.